Rob Reiner cut his professional eye teeth on the cutting edge comedy of Norman Lear during Reiner’s eight seasons on All in the Family. The release valve for the tension conjured by the off-color bigotry spouted by Archie Bunker—or, for that matter, George Jefferson in The Jeffersons and Fred Sanford in Sanford & Son, also Lear creations—was the character eventually being shown the folly of his views, whether by epiphany or comeuppance. That outlet isn’t present in And So It Goes, an otherwise benign old age romance directed by Reiner and designed to dislodge Hallmark Channel viewers from their couches for an annual trek to the local cineplex. The screenplay is credited to Mark Andrus, still living off his As Good as it Gets cred. But for the most part it’s as dull as its remarkably unimaginative title, a script seemingly salvaged from a false-bottomed sideboard at Nora Ephron’s estate sale. However, it’s also a film premised on the regressive notion that all women really want from a mate is money and children. 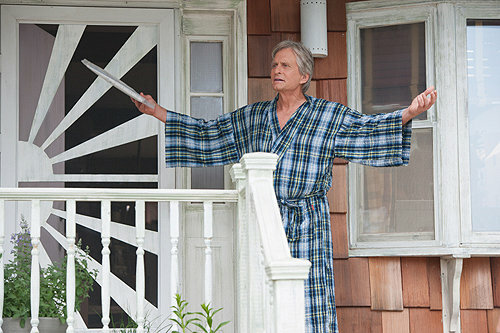 That’s the only way to explain the romantic sparks between widow Leah (Diane Keaton, natch) and her widower neighbor Oren (Michael Douglas), an irascible realtor past his prime. Oren winds away his days hurling insults at the rest of his apartment complex neighbors, including kids, women and African-Americans. Meanwhile, Oren’s efforts to unload his multi-million estate for one last big score are stymied by his insensitivity to every potential buyer. All Asians look alike to him, and a Latino couple out house hunting are repeatedly confused by Oren and his secretary for the lawn care help. Even Oren’s eventual comeuppance in this regard is a stereotype: the husband turns out to be a professional baseball player. Oren and Leah develop an improbable attraction, spurred by the arrival of Oren’s young granddaughter Sarah (Sterling Jerins), dropped off by Oren’s estranged son Kyle (Austin Lysy) on his way to prison. Not for anything salacious, mind you, but only for refusing to turn snitch on a friend for a white collar crime for which Kyle had no culpability … of course. Oren is the sort of role that Jack Nicholson used to get. But in contrast to Nicholson’s curmudgeonly charm, Douglas appears just skeevy. He scores Leah a more lucrative crooning gig in order to score some nookie, and he passes Sarah off to Leah the moment his granddaughter lands on his stoop. And with the gender and ethnic barbs flying, there’s an elitist streak throughout the film, as well. Oren urgently locates Sarah’s biological mother so he won't have to play daddy for several months. But after going to the effort of reuniting the woman with her long-lost daughter, he wrests Sarah from her crying mother’s grasp after seeing that she lives on the seedy side of town.